Free Willow Sculpture Workshop at Carymoor Saturday 27th Nov.
On Saturday 27th November, Carymoor Environmental Centre will be holding a willow sculpture workshop, the latest event in our series of exciting intergenerational art projects. Carymoor has gained funding to develop this project through a Somerset-wide intergenerational programme called 'The Company of Voices'. Supported by CHYPPS (Children & Young People's Partnership in Somerset), the project aims to bring young people and older people together in a fun and inspiring way to improve communication and understanding between generations. Anyone between the ages of 12 and 25 or over 50 is welcome to take part and should contact Carymoor Environmental Centre to book a place. 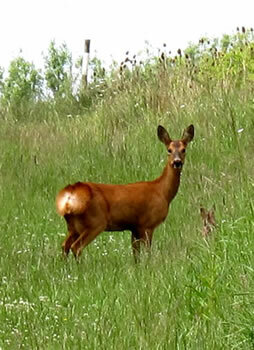 Local willow artist Amanda Rayner will be leading this free event, helping the participants to create a life-sized sculpture of a roe deer, one of the animals living on the restored landfill site at Carymoor. 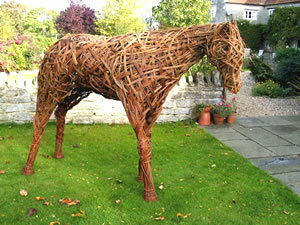 The willow used to create the sculpture, similar to the horse seen here, will be harvested on site from the copse planted a few years ago specifically for craftwork. The finished sculpture will be displayed in the gardens for everyone visiting the centre to enjoy. Anyone who is not in one of the target age groups for this project but would like to learn how to do willow weaving will be pleased to hear that Carymoor is planning a series of workshops in the New Year which will be open to all age groups, including basket making, living willow sculpture, and making garden structures like willow hurdles and wigwams. For more information email or phone 01963 350143.